The grand parade commenced in Lymm Village centre at 1.30pm led by Peter Powell Town Crier for Lymm & District. The Mayor of Warrington, Sheila Woodyatt and Consort Neville Woodyatt followed in the official car. The weather, although showery, stayed fine for the parade. 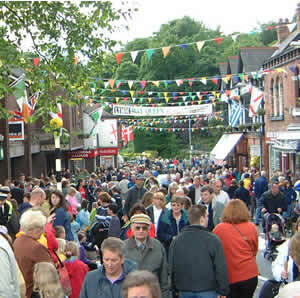 A large crowd of public support welcomed the procession through the Lymm Village Centre. The May Queen Elect this year is Miss Daniella Clarke, she was crowned by the retiring May Queen Miss Jessica Carville. The Rose Bud Elect this year is Miss Tara Liversey who was crowned by the retiring Rose Bud, Miss Rebecca Wright. After two trips around the village the procession gathered on the May Queen field where entertainment continued throughout the afternoon. The local Scouts 1st Oughtrington, 3rd Lymm and 4th Lymm provided refreshments and take-away food for all. Thanks go to the organisational committee, especially Lynn Shaw (festival organiser), Richard Carter, Linda Cooper, Jenny Kinder and Anne Davies. Thanks also to all the community helpers, procession marshalls, St John's Ambulance, Cheshire Constabulary, and Lymm Parish Council for their financial Support.